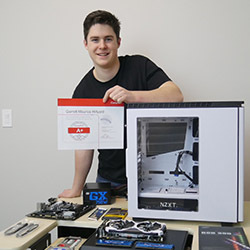 After Garrett Hillyard first earned his CompTIA A+ certification at age 12, he was determined to pass the new CompTIA A+ 220-901 and 220-902 exams on his first attempt. He did just that in December 2017 using the CompTIA A+ 220-901 and 220-902 Exam Cram from Pearson IT Certification and the quizzes, practice exams, real world scenario case studies, and other extensive prep tools included with the study guide. Now age 15, Garrett proudly carries his wallet-sized A+ card every day. His family was waiting at a busy Subway restaurant when the POS network went down and a clerk notified customers that the restaurant could only accept cash payments. Garrett shared his A+ credentials and asked if he could provide some technical assistance. The network was back up and running within 10 minutes and Garrett enjoyed a free sub that evening from the very appreciative restaurant staff! Garrett has stayed very busy in the years since his first certification working on custom computer builds, upgrades, and teaming up with his older brother Tristan to record videos of their projects. Tristan also recently passed the CompTIA A+ 220-901 and 220-902 exams to recertify and Garrett helped him study with daily quizzes. 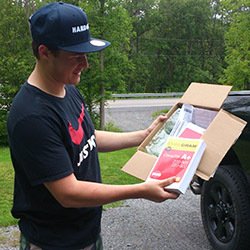 After Tristan’s last exam, the instructor at the Pearson testing center in Toronto invited them both to speak with students about their exam preparation experience and recommended study materials. 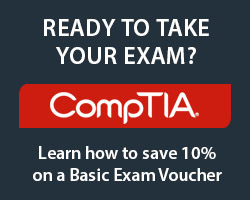 For a limited time, use discount code APLUSCERT during checkout to save up to 70% on featured CompTIA A+ learning materials by David Prowse*. Offer expires April 30, 2018. * Prices displayed reflect purchase of eligible title and application of discount code APLUSCERT. Discount code APLUSCERT confers a 50% discount off the list price of ISBNs 9780789756312, 9780134391519, 9780789756312, and 9780134391458, and 70% off the list price of ISBN 9780134510286, when purchased on pearsonITcertification.com. Book + eBook bundles, book/eBook + video bundles, individual video lessons, non-discountable titles, titles on promotion with our retail partners, and any title featured as eBook Deal of the Week or Video Deal of the Week are not eligible for discount. Offer ends 11:59 p.m. EST December 31, 2018. Discount may not be combined with any other offer and is not redeemable for cash. Offer subject to change.